I don’t know about at your house, but around here before dinner is one of the most hectic times of day, which is why I love freezer cooking. Having a freezer full of meals makes my life so much easier and frees me to take care of other things. I’m pretty picky about which meals I make because I want them to be easy, healthy and frugal. That’s why I’m excited to be bringing you another freezer cooking session that matches that criteria, this time with no cooking required and as always there is a free downloadable recipe and shopping list available for your convenience. All meals should be cooked 8 hours on low or until meat and veggies are cooked through. Step 1: Gather all ingredients. Step 2: Label freezer bags. Step 3: Wash and chop vegetables for all recipes. Step 4: Open cans for all recipes. Step 5: Assemble meals and freeze. *Once cooked, serve with rice or pasta. *Once cooked, serve with whole wheat spaghetti. Hi! I just found your post via the Modest Mom linkup! So I have had a crock pot for 6 years and only used it to make yogurt and keep soup warm at a party. Everyone says they love them, but I just don't get how to use it. Why would I want something to cook slow rather than fast on the stove? The simple freezer meal idea makes sense to me though! These would be great to have on hand when you are sick or know that you'll have a busy evening. I just might attempt to use it now! I can understand your thinking! I love my slow cooker though because I can do all the work beforehand and then when dinnertime rolls around its already taken care of which is a huge blessing with little ones running around! what does "make recipe x2" mean? To make two of the packages so you will end up with six meals. Such delicious and easy meal ideas! I haven't done a lot of freezer cooking, but need to start doing it more. I'm pinning these ideas for later! 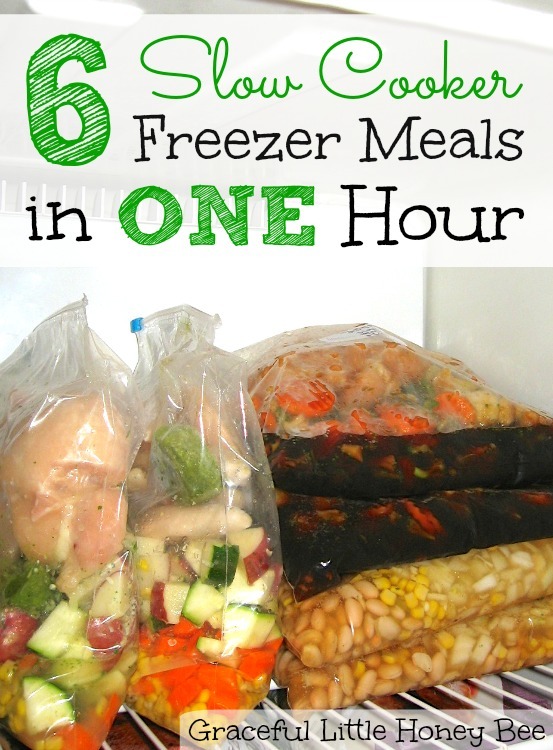 Freezer cooking is one of the best ways to save time and money. Thanks so much for sharing your menu with us. Pinning! Saw your link on Thirfty Thursday and had to stop by. I keep seeing these Freezer meals all over the place, and keep procrastinating. Seeing that you can do this all in one hour, well who can say no to that? Just have to make my grocery list and try this out over this weekend, or maybe next. Hey, once a procrastinator, always a procrastinator. Yes, the time before dinner is hectic here too! I haven't done much with complete meals in the freezer, but I do like to add marinade or flavor to the meat when I freeze it. Best wishes! Great post, love it! I am a 9 to 5 working mom, and once I get home, I am always tired. So I do prefer to cook something very very quickly. One of my favorite thing to freeze is a soup! Typically during a weekend I make a huge pot of soup and then half of it I put into my freezer. It makes it so easy to just use it whenever I am super tired and want to cook something fast. I agree. I love having meals in the freezer for when I don't have the time or energy to cook. What are the crockpot settings and cooking times for each recipie? I believe they are all 8 hours on low, but all of that information will be in the free printable. Hi All, So I have a few questions. I am new to this idea of frozen meals and slow cookers as well. So i basically prep everything into a ziplocbag is it? And then when I need to cook it just put it in frozen? Or do I need to thaw it out? And how long do I cook them? Is it 1 hour like the article mentions? Or is it 1 hour that it takes to prep meals? Sorry I wasn't sure. I need to start using this crock pot because Im planing on going back to school and plan on using it quite a bit. These recipes sound detlicious and easy. Could you cook these high 4/5 hours or would it make the veggies too mushy? I am a stay at home mom with for 4 kids but trying to keep the house cool this summer. Thanks so much! You probably could, but I can't say for sure how the veggies would turn out. Hi! I am excited to try freezer meals! Thank you for providing these. You list frozen chicken breasts, do they need to be boneless or bone-in? Also, in the store it seems the chicken is always defrosted, not frozen in the meat section...am I supposed to buy that chicken or a big back of fozen breasts from the freezer section? Thank you so much! How long do you cook each meal? 8 hours on low or until meat and veggies are cooked. I just cameacrossyour Facebook . I love the tips and the freeze ahead meals Thank You. Why aren't you adding ginger to your teriyaki recipes? I am a huge fan of your sight. Thank you for all of your recipes and tips. Could I put all of these meals in an instapot as well? If so do I put it on the poultry setting and for how long? I am not exactly sure, but I bet you could google, "How to convert slow cooker recipe to pressure cooker " and get your answer. Hi, Are you supposed to drain the beans for the chilli? You do not need to drain the beans.